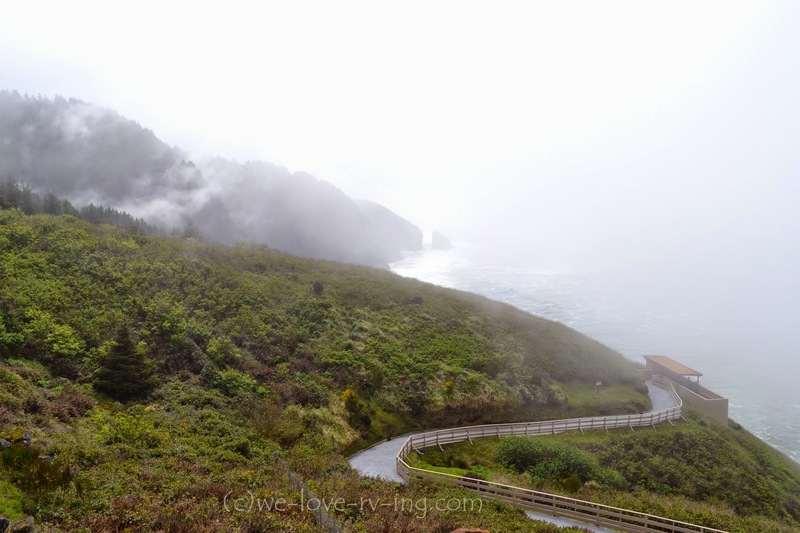 Most of the sights we see as we travel along the Pacific Coast Highway are the beautiful views of the rocky shoreline and the endless supply of splashing waves. There are other incredible sights to see, as well, and we spent some time enjoying one of those. 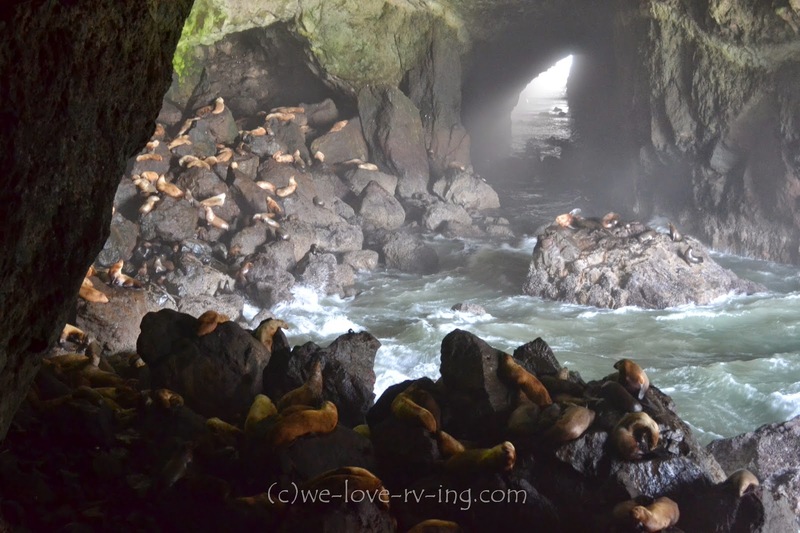 America’s largest sea caves are 11 miles north of Florence, Oregon and a year round home of Stellar sea lions. 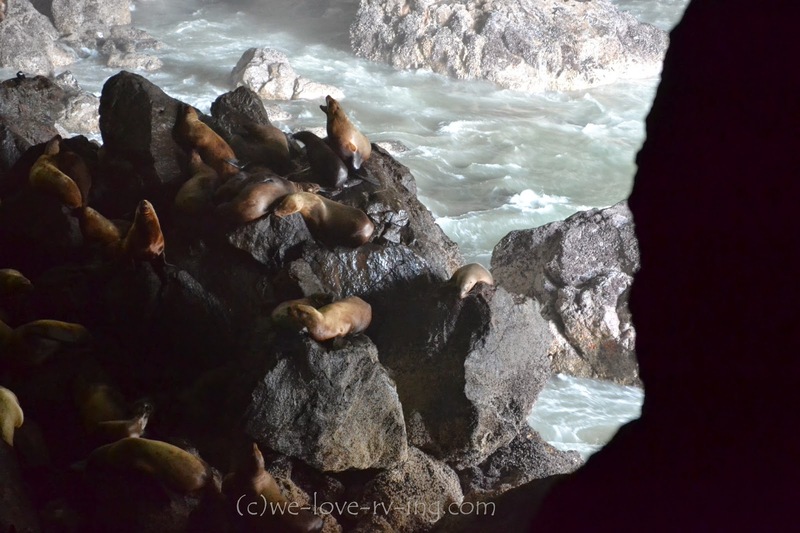 The sea lions may not always be in the cave, depending on the time of year for breeding or birthing but you could check that online with the Sea Caves to make sure the sea lions would be there for your visit. After descending in the elevator for 208 feet, we entered the darkened cavern which is quite large. It uses the natural layout and does have a sign to warn us it could be “subject to earthquakes, erosion and landslides”! Nice! The one area for viewing has a mesh screen to prevent anything or anyone from falling but the noises are not blocked. The noise was incredible! 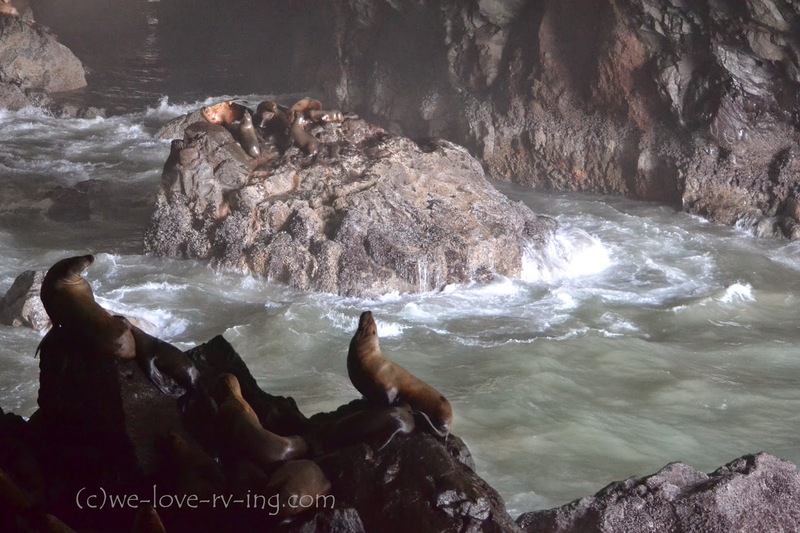 They all seem to want to be heard and the roars, grumbles and growls are a constant loud noise above the splashing waves coming into the caves. 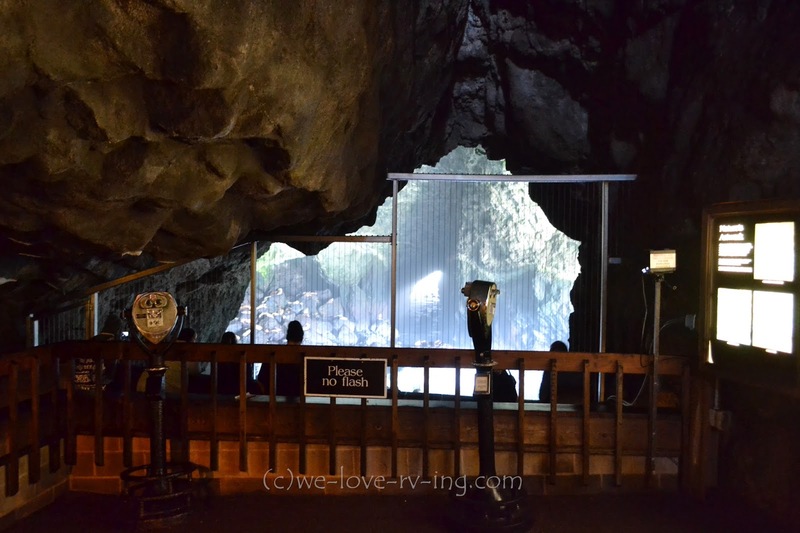 Springtime turned out to be a perfect time and there were hundreds in the caves for our visit. 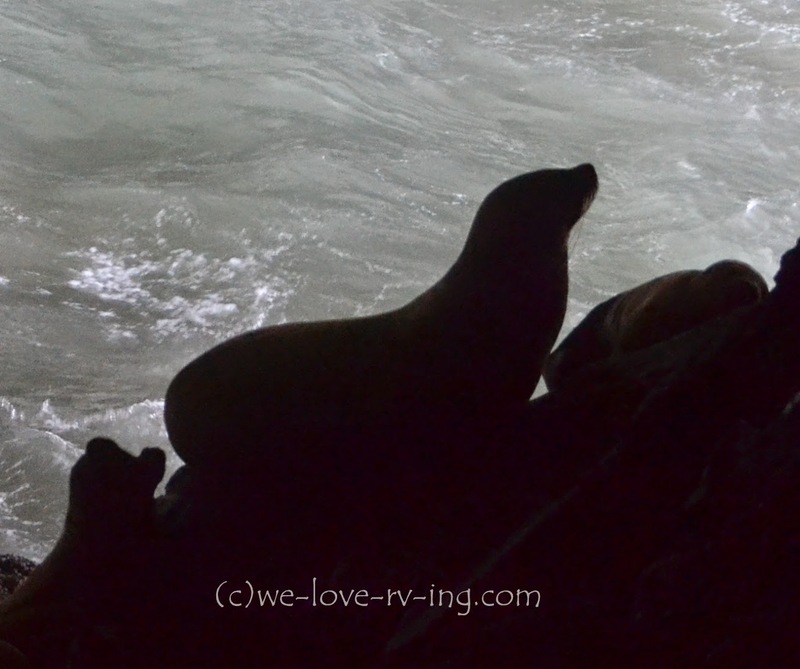 These beautiful sea lions were all over the rocks with some wiggling for the same space and pushing another away. The cave is lit up only with the daylight coming in through the mouth of the caves so plenty of them cannot be seen from our vantage point but watching those we could see was fascinating. The Stellar, also called the Northern Sea Lion is the biggest of the seven species of sea lions. The female’s average length is 2.5 m (8.2’) and 263 kg (580 lbs). The average male is 3 m (9.8’) and 544 kg (1199 lbs) but are known to be as large as 3.3 m (11’) and 1134 kg (2500 lbs). They are found in Alaska, Japan, British Columbia, Washington and Oregon, sometimes down into California. The Stellar are often confused with others, especially the California sea lion, even though there are physical differences between all species of sea lions. Most seafood is their diet. They do not chew but swallow whole so that sounds interesting, who knows what goes on inside their stomach! Young pups can nurse for as long as 3 years. Adult males eat 5-6 % of their body weight daily and young ones need twice that amount. Another viewpoint from within the caverns of the sea lion caves looks north to the Heceta Head Lighthouse, circa 1894 and is the brightest light on the Oregon coast. The beam can be seen 33 km (21 mi) out to sea. 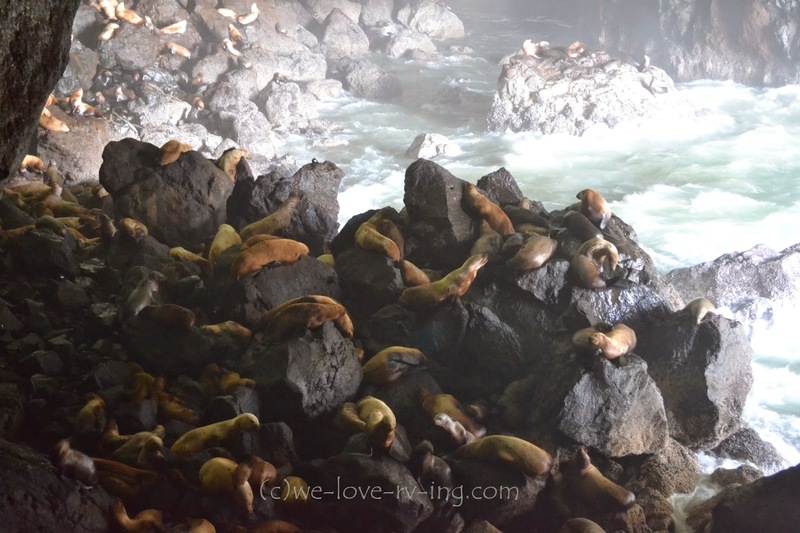 The Sea Lion caves are privately owned and part of the Oregon Cape Perpetua Marine Reserve which protects the local marine animals and environment. The Stellar sea lion was considered a near extinction species only a couple of decades ago but thanks to organizations like this, their population has increased about 4% annually over the past years. The size of the sea lion is deceiving when watching them from this distance. The cave is about the height of a 12 story building and the size of a football field, covering about 2 acres. 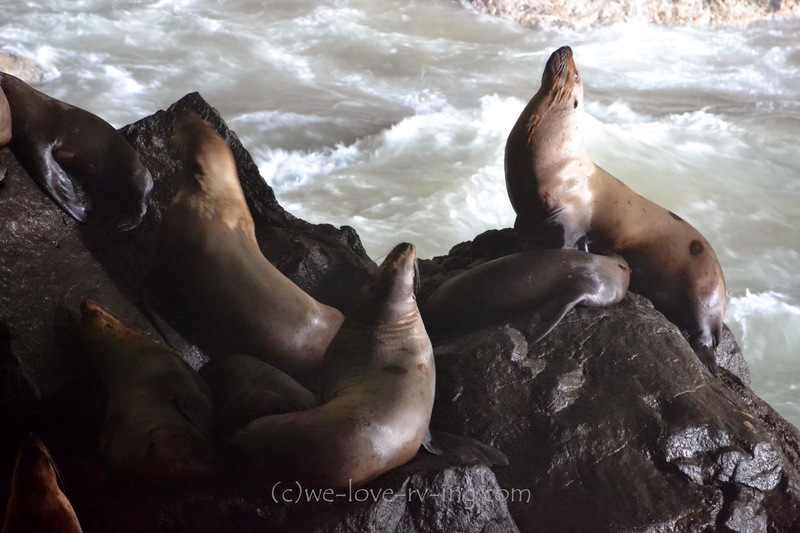 They are not cuddle material but they sure do make for some fascinating moments, an incredible sight to see on the Oregon coast. 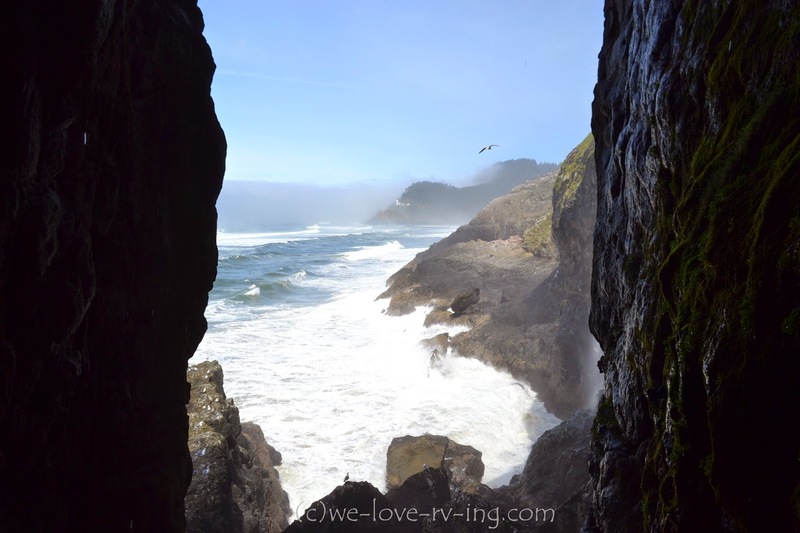 For more of the Oregon coastline, click here. It's a great place to visit and the noise can be deafening. The first time I visited the caves was on a family vacation in late 50's (dating myself) and we had to walk down many stairs to the bottom. We were at the caves about 10 years ago and could still see remnants of the stairs. Really enjoy your blog.